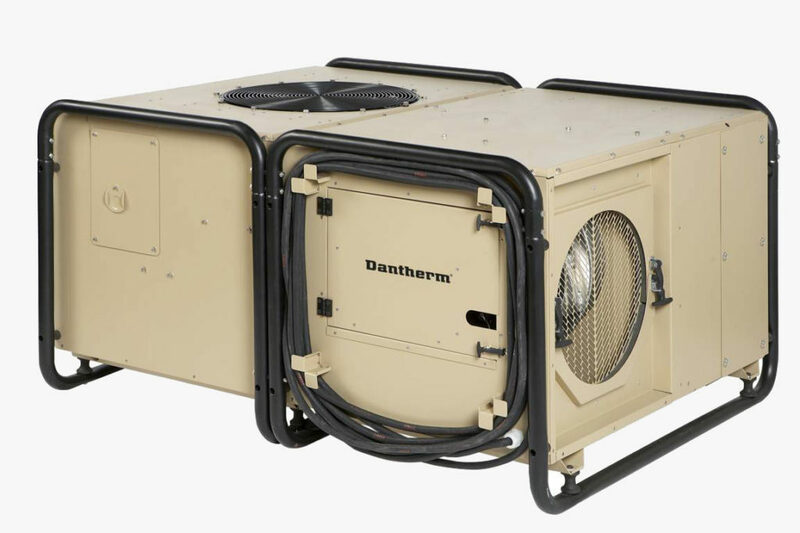 Dantherm Air Conditioners are transportable environmental control units, developed primarily to provide air conditioning in temporary or transportable buildings, tents or ISO containers. They are small lightweight units made out of aluminium and built into a rigid steel frame. The ACM air conditioner is designed to be placed outside, with supply air and return air ducted to the tent. 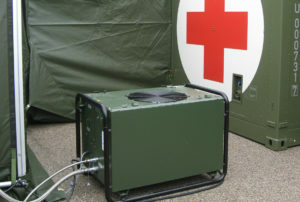 For field hospitals where environmental control mandates a higher level of filtration, a dual filtration system for the internal air path is available. A cooling circuit and two powerful fans are the basis for the Dantherm ACM air conditioner series. 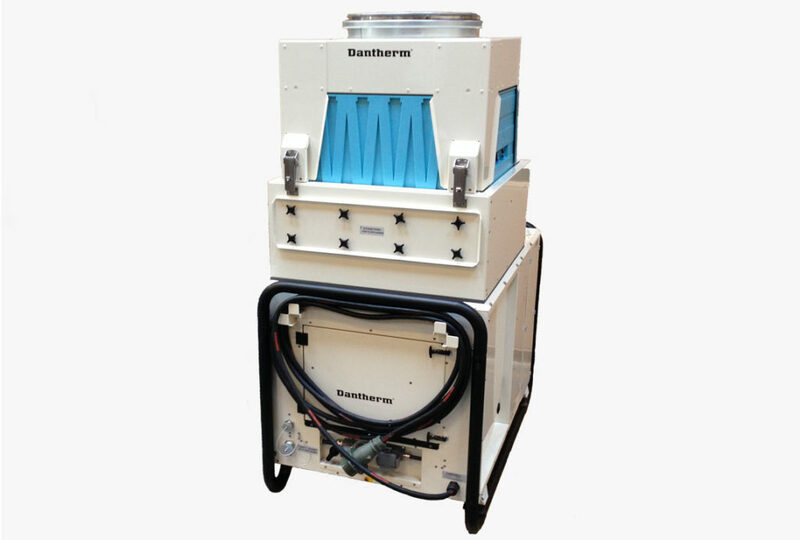 The evaporator section contains the evaporator and a radial fan, which draws warm internal air from the tent through the cold evaporator and blows out the cooled air through the side or the top of the unit. A condenser section contains two condenser coils and a large axial fan, returning the heat taken from the internal air to the outside atmosphere. An electric heating coil is fitted to the air conditioner to provide heating when temperatures fall under 20’C. All sheet metal parts are protected against corrosion by a minimum 80um top coat. 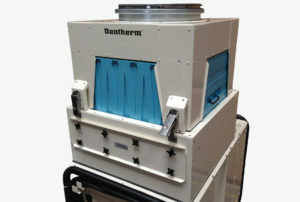 The Dantherm AC-M5MKII is designed for window mounting in ISO containers. Together with the trap door system the air conditioner is mounted in the container wall. It is designed to store within the confinement of the ISO corners during transportation, or storage. The AC-M5MKII slides in its trap door system and is deployed from the within the container for operation. Once deployed the unit is locked from inside the container when operating. The AC-M5MKII is based on a cooling circuit with two powerful fans. An evaporator (inside the container) section contains the evaporator core and a radial fan, which cycles the warm internal air from the shelter through the cold evaporator core and expels the cooled air through the discharge grill. 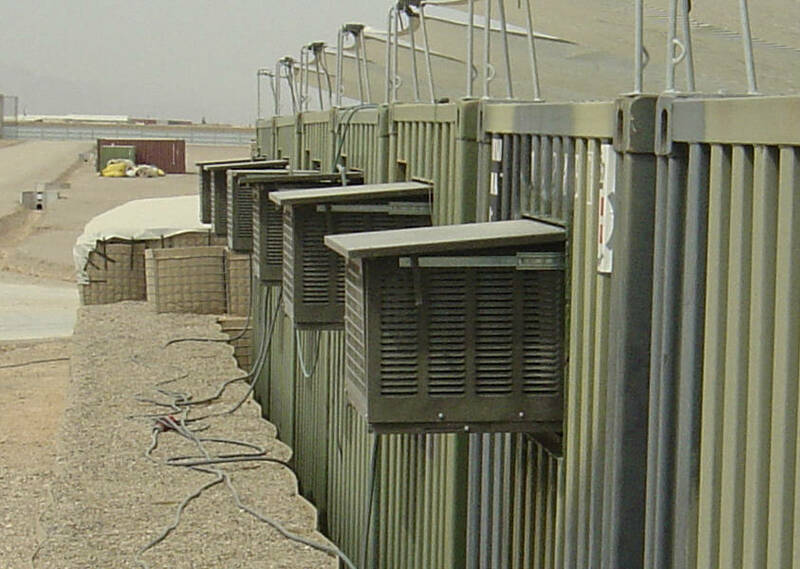 A condenser (outside the container) section contains the condenser core and an axial fan, which is moving the heat from the internal air to the outside atmosphere. The condenser circuit is not filtered. Instead of filtering this air path, sand and debris entering the unit will be expelled through holes in the bottom of the AC-M5MKII. This means low maintenance. 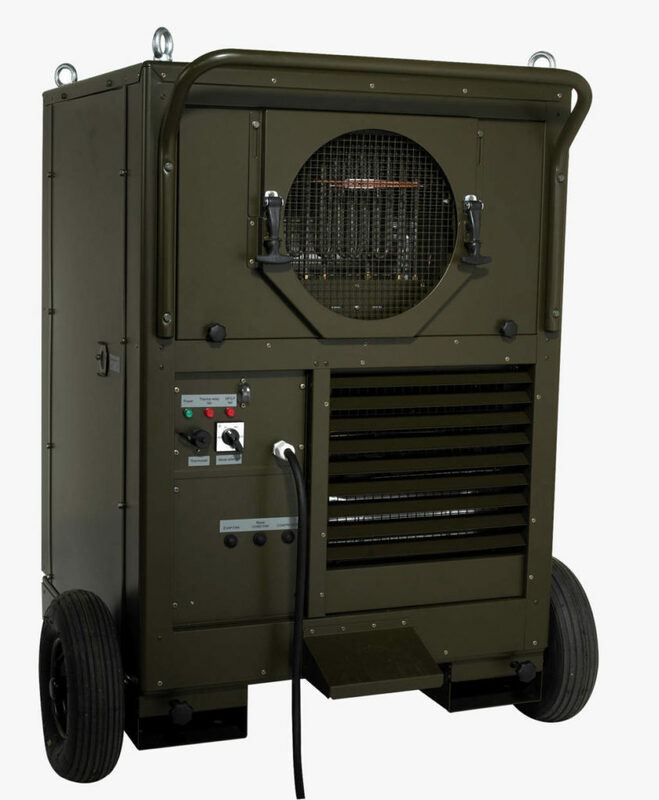 The Dantherm AC-M7MKII Air Conditioner is a 7-kW portable unit, developed primarily to provide air conditioning in temporary or transportable buildings or tents. 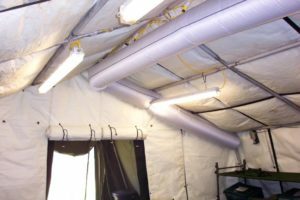 Designed to be placed outside the with supply air and return air ducted from the AC-M7MKII to either one (1xØ315) or two tents (2xØ225). The AC-M7MKII is based on a cooling circuit and two powerful centrifugal fans. The upper section contains the evaporator and evaporator fan, which draws warm ambient or recirculated air through the cold evaporator coil and supply the cooled air through the discharge into the room. The lower section of the unit houses the condenser fan and condenser coil, which return the heat taken from the cooled air to the surrounding atmosphere. 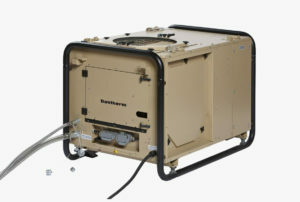 The Dantherm AC-M11 air conditioner is a portable unit developed primarily to provide air conditioning in temporary or transportable buildings or tents. The AC-M11 is a small, light-weight aluminium unit built into a rigid steel frame, designed for deployment outside with ducted supply and return air. 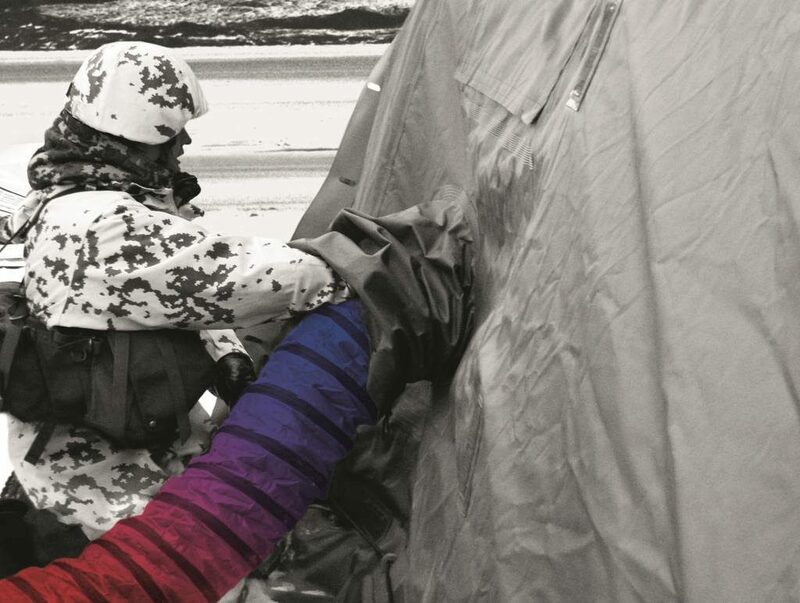 For field hospitals, where the need for filtration is higher than that of normal accommodation, a dual filtration system for the internal air path is available. The function of the AC-M11 is based on a cooling circuit and two powerful fans. The evaporator section contains the evaporator and a radial fan which draws warm internal air through the cold evaporator and blows out the cooled air through the side or the top of the unit. The condenser section contains two condenser coils and a large axial fan returning the heat from the internal air to the outside. A 12 kW electrical booster heater is available as a supplement to the AC-M11. With a booster heater fitted the AC-M11 has an operating range from -40°C to +60°C. 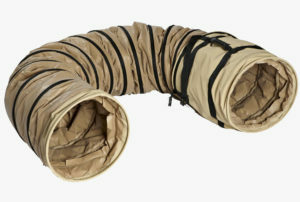 This solution is designed for field hospitals where stable inside temperatures are very important. The wheel kit add-on-solution can be fitted to the AC-M11 on site without using any tools. With easily accessible handles to lift the unit into transport mode the AC-M11 can be manoeuvred into position by one person. 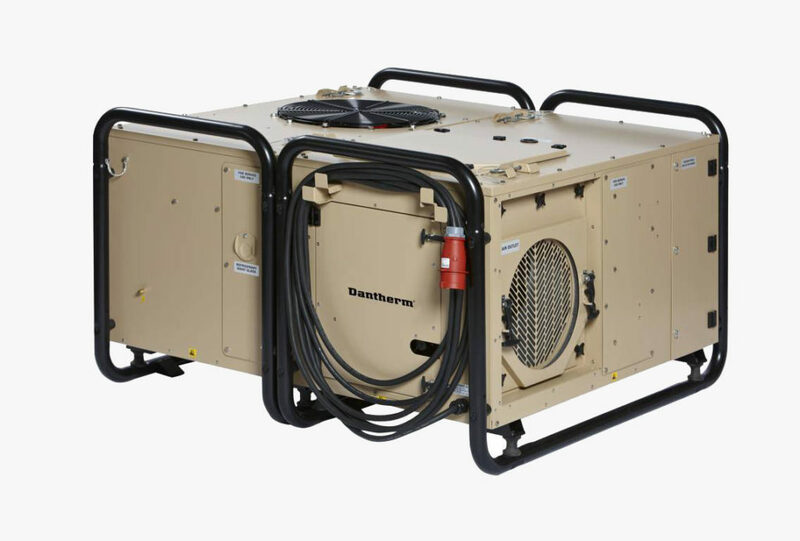 The Dantherm AC-M18 air conditioner is a portable unit developed to provide air conditioning in temporary or transportable buildings or tents, designed for outside installation with ducted supply and return air. 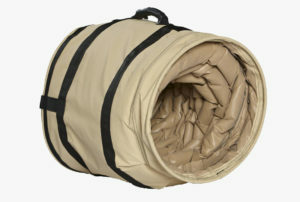 For field hospitals where the need for filtration is higher a dual filtration system for the internal air path is available. The AC-M18 is also available as a split system for sealed applications (AC-M18 CBRN). The function of the AC-M18 is based on a cooling circuit and two powerful fans. The AC-M18 can be equipped with an electric heating coil to provide heating for when temperatures fall under 20°C. 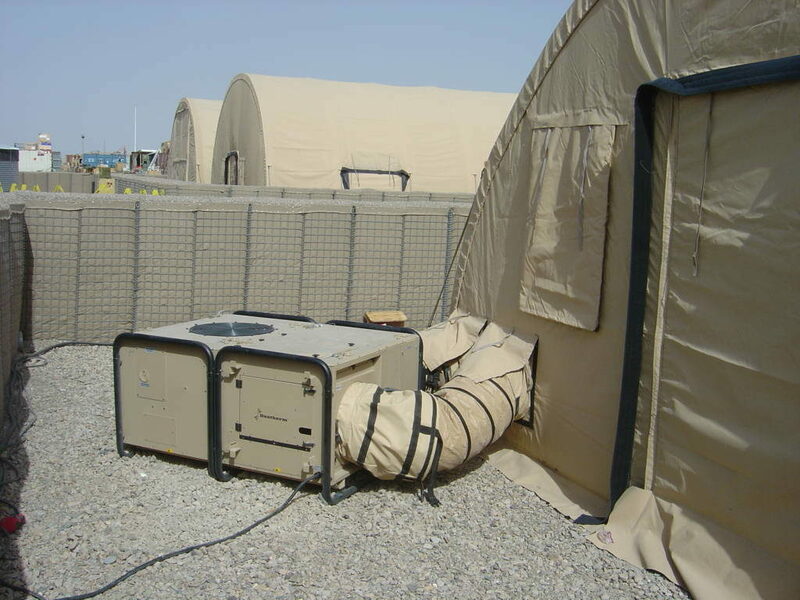 The Dantherm AC-M18 CBRN air conditioner is a portable unit developed primarily to provide air conditioning in temporary or transportable buildings or tents. 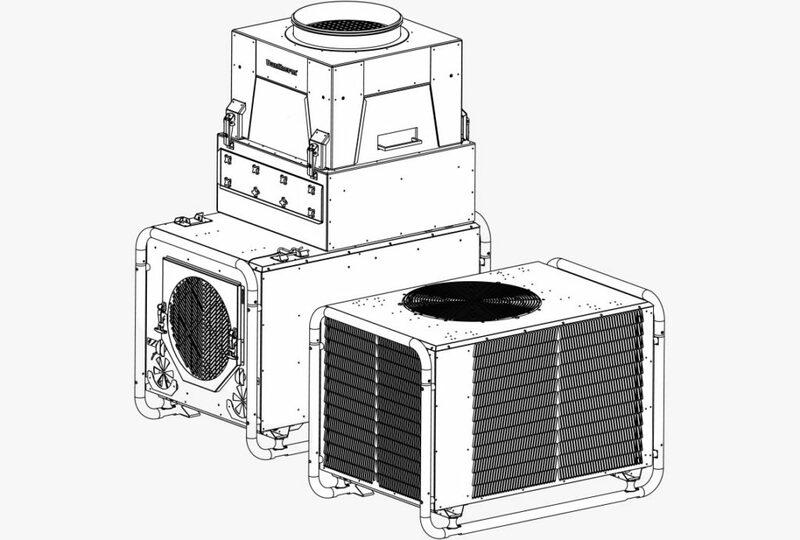 The air conditioner is designed to operate on COLPRO applications with the evaporator module placed inside the shelter and the condenser module placed outside. 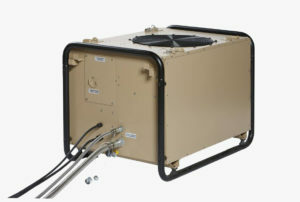 The two modules are interconnected by refrigerant hoses and power cables. The function of the AC-M18 CBRN is based on a cooling circuit and two powerful fans. A condenser section contains two condenser coils and a large axial fan returning the heat from the internal air to the outside. 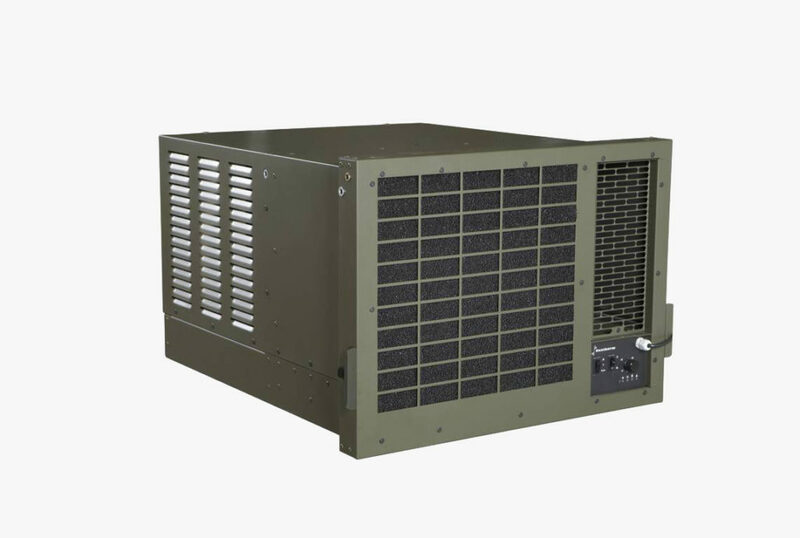 A HEPA filter unit is available as a supplement to the AC-M18 CBRN aircon for use in clean room solutions such as field hospitals and workshops for sensitive equipment. The HEPA filter unit can be fitted with different kinds of filters depending on the actual requirements. Various filter are available. The HEPA filter unit is for external installation and it is mounted on top of the AC-M18 CBRN evaporator side over the upper supply opening. As a supplement to the AC-M18 CBRN aircon a HEPA filter unit is available for use in clean room solutions. The HEPA filter unit can be fitted with different kinds of filters depending on the actual requirements. Various filter types are available. The HEPA filter unit is for external installation and it is mounted on top of the AC-M18 CBRN evaporator side over the upper supply opening. The HEPA filter unit is designed for clean room solutions such as field hospitals and workshops for sensitive equipment. The 400mm ex. 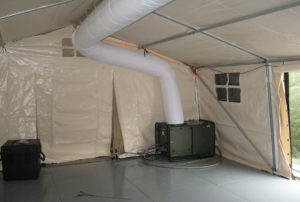 air duct system is used in conjunction with AC-M18 and ACM18 CBRN air conditioning units. The system is designed to be used as a standard air distribution solution to fit different types of tents. These ex. air ducts are connected to each other by an easy to use ring system. Each end of the ducts has a flexible ring which will be deformed to make it oval and set into the next duct opening. After releasing the ring it will get its normal round shape back again and hold both ducts tight together. 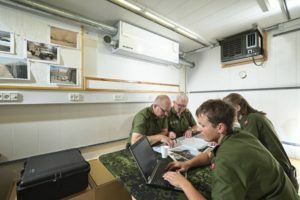 A HEPA filter unit is available for the AC-M18 CBRN aircon for use in clean room solutions such as field hospitals and workshops for sensitive equipment. The HEPA filter unit can be fitted with various kinds of filters depending on the actual requirements. The HEPA unit is mounted on the top of the ACM18 CBRN evaporator side, over the upper supply opening. Besides the clean room advantage, the HEPA filter unit also offers a reduction of the internal fan noise from the aircon of 3 dB (1m distance). The HX-M100 is a small, highly efficient add-on heat exchanger unit designed to supply and exchange fresh air into containers while reducing power consumption. By treating ambient fresh air before it enters the internal side of a container the HX-M100 can potentially save up to 50 % of the power consumption used to control the climate inside the container. The unit is designed to be mounted inside the container, preferably under the roof where supply air and return air ducting also is to be placed. The heat exchanger unit is designed to operate together with an ACM5 MKII or any other environmental control unit. In a conventional setup fresh air is taken into the container and the environmental control unit will use energy to cool it down to the set temperature. In order to have a constant air change inside the container some of the already cooled air is exhausted out of the container wasting energy! With an HX-M100 heat exchanger unit, the cold air is used to cool down the warmer fresh air through the heat exchanger before it enters the container. This minimizes the operation time of climate units. 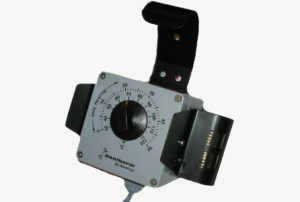 The Dantherm remote thermostats are designed for rough handling and wet environment to work safe under all conditions. They will normally be placed inside the tent to control the Dantherm warm air heater or air conditioner which is placed outside. Thermostat for automatic switch between heating and cooling. A wheel kit is available as a basic add-on-solution which can be fitted to the air conditioners AC-M11, AC-M18 and AC-M18 CBRN on site without using any tools. 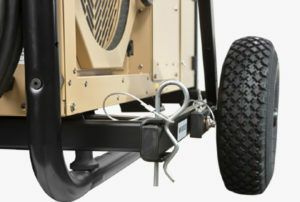 Two cross bars are slid under the unit and the wheels are mounted on the two sides. Easily accessible handles lift the unit to ”transport mode” and the ECUs can be transported and moved to the optimal position by only one person. Moving the handles back to ”start position” lifts the two wheels from the ground and the unit finds a stable and secure position. In situations and sites where no forklift is available, the wheel solution enables rapid and easy deployment of the environment control systems. The wheels are of a soft and solid PU material and guaranteed puncture-proof.